1000Memories: A Loved One Has Passed Away. What's Your Digital Strategy? A loved one dies. You get things under control by notifying family and friends, working with a funeral home for the physical remains, and generally getting everything done that needs to get done. You may even get the obituary taken care of for the newspaper, if you still have a local newspaper. But one thing that our culture hasn’t really figured out yet is how to celebrate a past life online. At some point soon we’ll start having an awful lot of dead people around. I’m very sure Google and other search engines will start to filter for deceased people search. It won’t be long at at until we have way more dead people online than live people online. Legacy.com has partnerships with newspapers to turn obituaries into online sites to commemorate the deceased, but they are more than a little cheesy in their cash extraction procedures. Other services like venture backed Respectance is less aggressive about getting money out of loved ones, but the site design is very dated and there’s still that leave-a-bad-taste-in-your-mouth feeling. 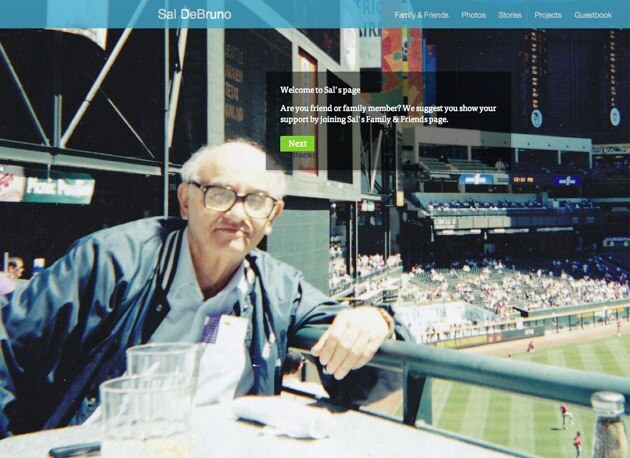 1000Memories launches today, a new service funded by Y Combinator that is trying to bring some dignity to the deceased online. There’s a big focus on design at 1000Memories. Here’s an example site, the great uncle of one of the founders. Visitors are first presented with a big picture of the deceased, presumably that one image that best captured his soul and personality. From there it’s easy to navigate to your next step as a reader, and sign a guest book. You can also invite others to the page at that time. But what makes each site really rich are the stories and pictures that loved ones add to the site. Some are silly. Others rip tears from your eyes. But it helps fill out the picture of a man, and it helps family and friends remember that man more richly. There’s also an area for projects – simple things like lighting candles for the deceased to setting up memorial funds for various causes. Best of all the company isn’t going to charge for the sites – they just don’t think that’s the right way. They’ll develop their business model over time, perhaps creating print books of the content that is left for an individual and letting people buy these books. They don’t need to make much per site, and it really doesn’t cost that much to keep these sites live in perpetuity. I wonder if, in a hundred and fifty or so years when I finally shuffle off this mortal coil, where I’ll end up being memorialized online. I hope it’s somewhere calm and serene like 1000Memories, and not somewhere that is just trying to gouge cash out of my family. I like this project, I hope it succeeds.